A BvPOS for your Retail Store! Whether you are a start-up or an experienced operator, our Point-of-Sale (POS) software allows you to easily manage your sales, stock and customers in one smart reliable system. 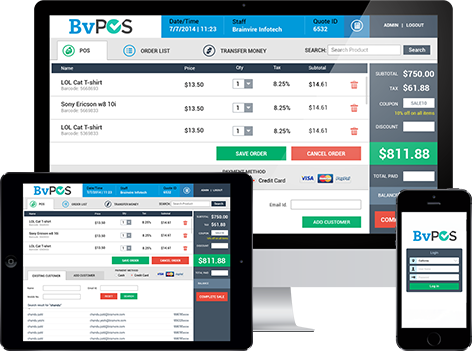 BvPOS is designed to quickly and easily enter sales order, take payments, integrate cash drawers etc. within the Magento back office. Brainvire has put together a perfect solution that will help your store assistants to complete the check-out for customers anytime, anywhere in your retail store! Mobile technology has completely changed the way customers shop as well as completely transformed the way retailers do their business in the palm of their hand. So, have a mobile strategy for your business and get an edge over the competition. With Brainvire Mobile POS software incorporate the power and functionality of a traditional POS workstation into a mobile device by equipping associates with mobile tools that provide easy access to robust product information and help customers make more informed purchase decisions. Beat the queues, engage your customers, improve productivity and profitabilty and reach new markets by choosing Brainvire's leading Mobile POS and payment solution. HOW OUR MOBILE APP FRAMEWORK WILL HELP YOU? Looking to open a store at other location? Simply add a new location and register cashier details. This will help to administer the products at different locations. Create customer groups to better organize your customer list. Customer groups can later be used for promotions, price lists and/or loyalty programs. Each cashier at different location is provided with their logins. Get to know your customers! Add new customers at BvPOS to begin tracking; previous customer lists can be imported from legacy system to make the transition as easy as 123! Place sales on hold and reopen at later time for speedy checkout. Add or edit products on the fly right at BvPOS. Every transaction is recorded to the customer’s card for easy access. Sales documents can be re-printed or emailed to customer at anytime. Create returns with ease, option to print receipts with scanable barcode to speed up the process. Query products by name or code, scan barcodes or select items from inventory list to add them to the transaction. Define loyalty points, rules and create promotional incentives. Loyalty Cards are also supported for quick and easy look up. Discounts can also be applied to the products. Send receipts, quotes or any other sales document directly to customers via email. Go green! Earlier, the logo was static, so you were not able to change it. However, now you can change the logo as per the needs and requirements, as it is dynamic. You can search the products using SKU. In addition to that, you can not only search simple products, but also search for the configurable products. Before product gets added to cart, a box will pop up to give you a quick review about the product details. In your cart, there will be the image of the product, which you have added into the cart. If you click on that image, a box will pop up which will show you the bigger size of the current image and also other images of that product. You can also add the ‘out of stock’ items into the cart. You can also show the list of ‘additional products’ which will be the products similar to the ones which are added into the cart for cross-selling. Shipping module communicates directly with shipping carriers to get real-time shipping quotes, apply shipping methods and print out shipping labels right at your register! Customers receipt print out with tracking details which are also saved to Brainvire’s POS backend for easy look up. Existing customers You can now not only search the existing customers by his name, mobile number or email, but also by his id. When you enter the name of the customer, a drop down will show you the list of the existing addresses of that customer. You can also add a new address or select the one from the available ones. Once you confirm the address, you can save that address in the address book. New customers Two new fields, ‘Tax exmpt’ and ‘Source code’ have been added for the new customers. Admin can notify the store manager, supervisors or cashier regarding a new offer or can send any other message individually as well as it can set a global message, which will displayed at the top when the user will login into the system. Now, you can also receive the orders on the phone call. Also, we have added a feature for shipping method, wherein cashier can select the shipping method. Once the shipping method is selected and order is placed, it can be invoiced. After it is invoiced, the order can be shipped. Also, you can add the tracking information.! The overall user interface of the point of sale system has been enhanced in order to make it easy to understand and fun to use. You can operate the important functions of POS system even without the mouse or mouse pad using the short cut keys.